We're way past overload on Trayvon Martin-George Zimmerman commentary, but there is a tiny tributary of the story that has been largely overlooked. And it's worth a moment because it points to a larger problem regarding both the state and the public. The first is the modus operandi of the Florida prosecutors. I understand that overcharging may be routine in the criminal justice system. It's partly what fuels the plea bargain system, and that's what keeps the entire machine moving rather than sputtering to a broken halt. But that doesn't make it right. If the public is to have faith in the system, we need to believe that prosecutors are acting in the interests of justice. Not looking for leverage. All political theories note that ancient legal systems began with the outlawing of private revenge, but the state does not thereby become a sort of hired agent or substitute avenger. That is what a theory of civil harms is for, and such torts are addressed not in criminal but civil courts, where the plaintiff, not the government, collects the monetary damages. Genuine crimes, in a modern setting, are instead committed against society and its laws—just as, in medieval England, all crimes were crimes against the king. In strict legal theory, the victims are incidental; the entire body politic is injured by a crime, and the social disorder of that crime is what a government's criminal-justice system must address. The prosecutor's job, then, is to act for the rest of society in seeking justice for social disorder. And properly understood, this job has two parts. She seeks redress for the laws that were broken. And she safeguards the rights of the citizenry—all of it, even the accused—against a misuse of power by the state. These duties might sometimes be in tension, but they are always of equal importance. The Zimmerman-Martin case suggests that when both the state and the public lose sight of the ideas that animate the system, it is more imperfect than it should be. Which should worry all of us. Jonathan V. Last is a senior writer at The Weekly Standard. His writings have been featured in the Wall Street Journal, the Los Angeles Times, the Washington Post, the Philadelphia Inquirer, the New York Post, the Claremont Review of Books, First Things, the Week, Salon, Slate, TV Guide, and elsewhere. #Zimmerman jurors were allowed their cell phones once a day for calls, voicemails, "in the presence of a deputy," @SeminoleSO says. #Zimmerman jurors also watched July 4th fireworks, went to movies to see “World War Z” & “The Lone Ranger,” @SeminoleSO says. #Zimmerman jurors excursions while sequestered: bowling, shopping at Volusia Mall, a St. Augustine trip, manicures & pedicures. The Seminole County Sheriff’s Office (SCSO) was responsible for the sequestration of the jury during the State vs. Zimmerman trial. The jury was originally sequestered on Friday, June 21 and spent 22 nights at the Marriott on International Parkway in Lake Mary, Fla. During the sequestration, jurors had individual rooms and convened regularly in a suite for meals and to socialize. Jurors watched television and movies, exercised at the hotel fitness center, and spent weekends being visited by family and friends. Jurors could also request visits from members of the religious community. Anyone visiting members of the jury was asked to sign an agreement indicating they would not discuss the case with the jury member or disclose any information to outside parties about the details of their visit. Most breakfast and dinner meals were provided through the hotel. Jurors dined out twice: at Outback Steakhouse in Sanford and at Amigo’s in Altamonte Springs. Dinner was also brought in from Giovanni’s in Lake Mary. Lunches typically took place at the courthouse with lunch brought in from area restaurants. The group went out for lunch twice, both times to Senior Tequila’s in Winter Springs. Jurors also enjoyed several evening and weekend excursions to include bowling, shopping at the Volusia Mall, a day and dinner in St. Augustine (to include a visit to the Ripley’s Believe It or Not Museum), manicures and pedicures, and watching fireworks on the fourth of July. Jurors also went to the movies to see “World War Z” and “The Lone Ranger.” All movies viewed were preapproved by the court. Jurors were provided access to the hotel’s laundry service or could send laundry home with family members. Jurors were permitted to go to appointments for personal care if accompanied by deputies. All television, internet use, reading materials, mail, and phone calls were screened, monitored and logged by deputies to ensure jurors were not exposed to any trial information, or content related to the criminal justice system. Jurors were permitted to receive their cell phones once per day to check voicemails and make telephone calls in the presence of a deputy. SCSO deputies provided security for jurors at all times during their sequestration. SCSO will not disclose the number of deputies assigned to this duty. In accordance with Florida Statutes, the Clerk of the Court is responsible for juror expenses for meals and lodging. Jurors paid for their own personal purchases and appointment costs. The Sheriff’s Office paid for the movie and bowling excursions and the Ripley’s admission. Although exact costs are not yet available, the hotel cost was approximately $1,000 daily, and meals were approximately $375 per day. The excursion expenses were approximately $350. In total, sequestrations costs were approximately $33,000. The Sheriff’s Office is still compiling the agency’s total costs associated with the trial. Preliminary figures indicate SCSO spent approximately $320,000 on overtime, equipment, other trial-related expenses. SANFORD, Fla. -- One of the people instrumental in helping George Zimmerman's defense team pick an all-women jury says that he decided months in advance that a female panel brought the best chance for acquittal. Robert Hirschhorn, a jury consultant with more than 28 years experience, told USA TODAY that women are better listeners, less judgmental, and would more easily understand the fear Zimmerman felt when he shot Trayvon Martin. "I wanted to make sure we were going to get jurors that would follow what the court of law required not what the court of public opinion wanted," Hirschhorn said. "My number one goal was to get fair jurors that would really be able to listen to the evidence and decide the case on facts and law not emotion." An alternate juror in the George Zimmerman murder trial says he supports the six female jurors' decision to clear the former Florida neighborhood watch captain of all charges in the shooting death of 17-year-old Trayvon Martin. In an exclusive interview with MyFoxOrlando.com, Juror E54, who was one of four alternate jurors in the case, says he felt the injuries Zimmerman sustained during the altercation were the most convincing piece of evidence in the trial. He also said he believed it was Zimmerman who was screaming for help in a 911 call played during the trial, not Martin. Jurpr E54, who asked that his name not be released and his face be obscured during the interview, also tells the station he relied on the testimony from the witnesses who heard Zimmerman and Martin fighting the night of the shooting. "I call them 'ear-witnesses,' the ones who heard the noises and which way the noises were going. They helped me fill the gap," he said. I understand peaceful protest. However, I don't agree with folks getting in to rush hour traffic. Besides being dangerous, I don't believe anyone has the right to stand in front of cars on a busy freeway, as that impinges on my right to drive home or wherever. Protest or rally in more appropriate venues. Why would a large group of protesters need to get INSIDE a mall? Trying to force their way in? It's private property, and I feel for the merchants there. And why would protesters go into a gas station, open items and leave without paying? That's not protesting, that's thievery. I believe we have the right to peaceful assembly and some are doing that, but some others are hooligans and thieves imo. Demonstrators held a peaceful rally in Beverly Hills against the George Zimmerman trial verdict, but 17 people were arrested during a rally that turned rowdy in Victorville, authorities said Wednesday night. Protesters rallied at La Cienega Park in Beverly Hills on Wednesday evening and then marched along busy Wilshire Boulevard in response to the Saturday acquittal of Zimmerman of second-degree murder by a Florida jury in the shooting death of 17-year-old Trayvon Martin. Some carried signs saying "We Are All Trayvon" and "Sin Justicia No Hay Paz," or Without Justice There is No Peace. The marchers snarled rush-hour traffic in the area but were peaceful, the Beverly Hills Police Department said. In Victorville, eight of the 17 people arrested Wednesday night were juveniles, the San Bernardino County Sheriff's Department said. Most of the arrests were made on charges of unlawful assembly. A department spokeswoman said most of the 80 people who took part in the rally were peaceful. But 10 to 15 juveniles went into a store at a Chevron gas station near Bear Valley Road and Balsam Avenue and reportedly opened items and left without paying, authorities said. A large group of people gathered at the Mall of Victor Valley parking lot and tried to force their way into the mall. They were stopped by security guards who locked the doors. Deputies from multiple stations responded and ordered the group to disperse, the department said in a statement. Most of the people left, but those who didn't were arrested. Another peaceful rally and march was held Wednesday evening in Pasadena. Last night in the ‘Late Show’ with David Letterman, far left comedian Bill Maher was booed for offering up some completely tasteless jokes regarding George Zimmerman, the neighborhood watch volunteer who was just found “not guilty” of murder or manslaughter in the death of Trayvon Martin, and the state of Florida. When Letterman has stated that Maher was a minority owner of the NY Mets, Maher followed up with, “Better than being a minority in Florida.” Then the boos came. But not to be out done, Maher then said, “You know they want to give George Zimmerman a gun now. The Florida state law is that he can get his gun back. I say if he gets a gun, Casey Anthony gets a baby.” Cassey Anthony was the Florida tot mom who got away with the murder and was found not guilty in the death of her two year old daughter Caylee Anthony who was found less than a mile away from her home discarded in the woods. Guess what then happened at the Letterman show, the boos came again and even louder. The sad part is Maher actually had to ask why they were booing. How bad were these tasteless jokes and how far LEFT has Bill Maher gone, even the crowd at the far-Left David Letterman show did not approve. Who would have ever thought the death of a 17 year old teen and the murder of a 2 year old child wasn’t funny? (CBS)The mother of slain Florida teenager Trayvon Martin said she was "stunned" at Saturday's acquittal of George Zimmerman, the former neighborhood watch captain who had been charged in their son's shooting death. Sybrina Fulton and Tracy Martin spoke on CBS This morning, speaking publicly for the first time since the controversial verdict. Zimmerman fatally shot Trayvon Martin last year during an altercation in a Sanford, Fla. gated community. Prosecutors argued Zimmerman profile Martin as a criminal, while Zimmerman argued he shot in self-defense. "I thought surely that he would be found guilty of second degree murder, manslaughter at the least. But I just knew that they would see that this was a teenager just trying to get home," Sybrina Fulton said. "This was no burglar. This was somebody's son that was trying to get home. "Fulton said that she was "stunned" by the verdict. Fulton and Tracy Martin were not in the courtroom as the verdict was read. She called on President Obama to investigate the case with a "fine-toothed comb," and also addressed remarks by a juror who said in an interview with CNN that her son played a large role in his own death. "I don't think she knows Trayvon," Fulton said. "Trayvon is not a confrontational person. Instead of placing the blame on the teenager, we need to place the blame on the responsible adult. There were two people involved. We had an adult who was chasing a kid and we had a kid who I feel was afraid." Trayvon Martin’s parents on Thursday asked President Barack Obama to go through the details of the shooting death of their son with a fine-tooth comb, saying that American teenagers don’t know how to behave in its wake. Appearing on “CBS This Morning,” Martin’s mother Sybrina Fulton, who appeared along with his father, Tracy Martin, was asked what she wanted the president to do. Our legal analyst says if Martin's family sues #Zimmermanon9 that stuff is more likely to come in at a civil trial. A local news/talk host just said that since the trial he has went back and listened to some tapes of the trial. He has discovered something that he is certain 99% of the people don't know. "Martin was almost home and came back." I swear that's what he said. The case is solved. Alagary, maybe he came to that conclusion from listening to the testimonies of witnesses Jeantel and Bahadoor? "I thought he was going to be OK because he was right by his daddy's house, but his daddy was not home," Jeantel said as Martin's father cried in court. And TM was running toward the T from his father's girlfriend's house--left to right? The witness, Selene Bahadoor, said she heard running, shouting and the word “no” at the back of her town house at the Retreat at Twin Lakes on Feb. 26, 2012, the night Mr. Zimmerman, a neighborhood watch volunteer at the complex, and Mr. Martin encountered each other. Ms. Bahadoor said she was in the kitchen when she heard what sounded like running, a movement from “left to right.” From a window at the rear of her home, she said, she saw what looked like two people flailing their arms. Both were standing, Ms. Bahadoor said, but it was too dark to make out their faces or clothing. (CNN) -- The Department of Justice has asked the Sanford, Florida, police department to hold all evidence related to the George Zimmerman case, Sanford Capt. Jim McAuliffe said Thursday. The request is related to the Justice Department's own investigation of the matter, McAuliffe said. The move was expected as the agency weighs whether to pursue a civil rights case. The Department of Justice opened an investigation into the Zimmerman case last year, and a statement from the agency Sunday said it was ongoing and will now include evidence and testimony from the Florida trial. 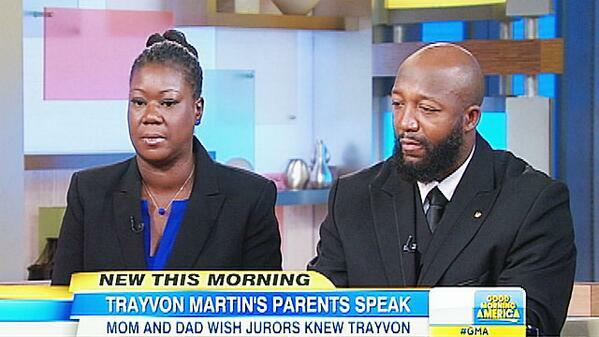 WASHINGTON — Trayvon Martin's parents plan to participate in separate vigils Saturday. Martin's mother and her son, Sybrina and Jahvaris Fulton, will join Al Sharpton outside New York Police Department headquarters. Martin's father, Tracy Martin, is set to be at a similar event at a federal courthouse in Miami. Sharpton's National Action Network is planning rallies in 100 cities to press for federal civil rights charges against George Zimmerman. Why should the President get involved any more thn he already has in this case? He better not or he will get himself in a heap of backlash. There is a survey on twitter asking if Obama should get involved and I think it was 91% said NO!